Thinking Of Visiting Thailand? The Best 6 Things You’ll Love About Thai Culture! Thailand is among the most popular destinations and cherished gems of Southeast Asia. This enchanting country has everything you can dream of every time you want to experience a fabulous vacation. You’ll surely cherish the company of friendly locals, tasty foods, breathtaking sites and more. But what you’ll fall in love with the most about the Thai is their unique culture. Thai culture is the quintessence of their beliefs and their way of living. It also denotes the respect and joy the locals cherish in one another, and other people in between. Below are some of the best wonderful things you’ll truly love about Thai culture. In the past few decades, the government introduced practices to promote nationalism. Among them being the country’s national anthem, which all locals are required to stop any activity and stand when the song is played. You’ll also be shocked to find even traffic comes to a halt when the national anthem is played on the radio to boost patriotism. According to Pre-Buddhist Hindu legends, a certain auspicious color is often linked with each day of the week. For example on Mondays, you’ll find that many locals like wearing yellow t-shirts to acknowledge and honor the day their king was born. The light blue color, which many people wear on Friday, marks the queen’s day of birth. Pink is also another favorite color that many locals wear a lot, particularly on Tuesdays. During political occasions, people like to dress in yellow and red t-shirts to show opposing movements. A slogan phrase, loosely translated as “mai pen rai” (never mind), represents the country’s unofficial philosophy to stay united. It reminds the locals to work and get along together, without being affected by small matters that could otherwise jeopardize their solidarity. Such matters are not to be taken seriously; besides anything worth-doing should have some element of fun! According to Buddhist beliefs, the head is the most respected part of the body. The feet are the least respected because of their attachment to the ground, and are often seen as a symbol of a person suffering. Touching another person’s head is highly forbidden, likewise with raising your feet and pointing them at religious objects or people. People should remove their shoes before entering any religious structure and even their homes. A great variety of clothes is permitted in areas flocked by tourists. However, you should always cover up when visiting shrines and temples. People with sleeveless tops, short skirts, flip flops, and shorts won’t have any access. It’s not unusual to see signs restricting women from entering respected sacred grounds, such as temple libraries. But they can worship outside the buildings. While it’s taboo for any woman to touch a monk or pass something to him directly, a casual conversation is fine. The Wai (pressing of the palms near the chest or nose level) and slightly bowing of the head, is a common greeting among Thais. You’ll notice it almost immediately once you land in Thailand. It’s a central part of Thai etiquette, and symbolizes respect and reverence, particularly when it’s performed in the presence of a Buddha image. Many locals use the same gesture to express a hello, kindly thanks, or goodbye. Food in Thailand is a big part and the heartbeat of Thai’s culture. In fact, many locals believe a visitor has not yet experienced any of Thailand if they’ve not tasted its food. Thai’s excellent cuisine tastes much better than any other foods you’ve ever tasted anywhere around the world. A person’s mouth simply dances with excitement while devouring every single piece till there’s nothing left. Order some sushi and “mai pet” (not spicy) dish, and you’ll find yourself having another plateful. 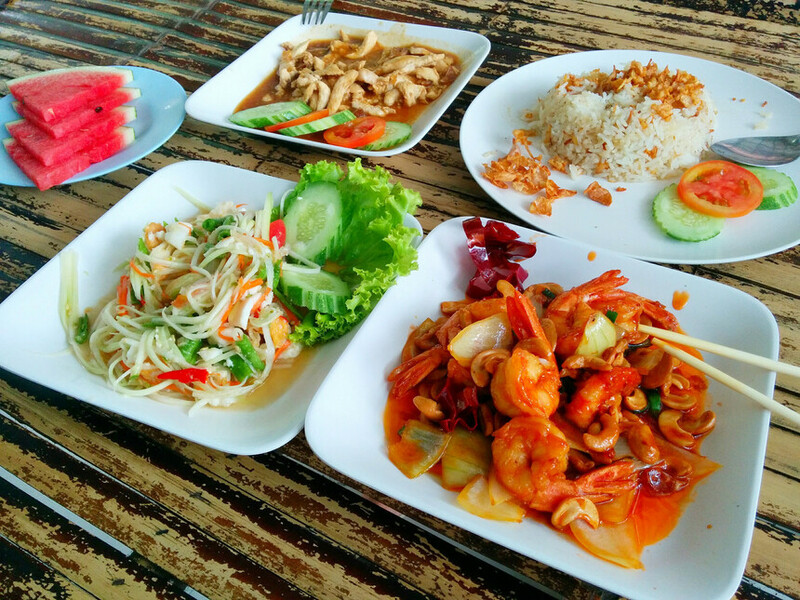 Outdoor stalls are the best place to find the most scrumptious and cheapest Thai meals around Thailand. If you’d love to taste foods from different cultures, many restaurants around offer a variety of Mexican and Indian foods. For frequent travelers, Bangkok is the first stop destination on travels in Thailand and across Southeast Asia. The laidback surrounding, beautiful people, and alluring culture make Thailand a hotbed for backpackers and avid travelers. Thai culture may seem a little shocking to outsiders at first, but when you mix with the people, you’ll love this magical country. Just to hit you with some update, above are some of the best interesting things you’ll love the most about Thai culture. There are many more to explore in Thailand! For example, you may also want to read on things to do in Chinatown Bangkok. It’s a lovely read that will make you dream to take your flight right away!